.• The delivery company we use will generally contact you 2 days before the day that they would like to deliver and give you an approximate time slot for that day. • Deliveries are made Monday to Friday dependant on location. 3-7 Working Day Direct from Manafacturer Delivery schedules for all bed frames i.e. leather, wood, metal, lift up storage beds, bunk beds, high sleepers, will be delivered flat packed for home self-assembly they are in the cases of Julian Bowen, Limelight, Emporia, serene, Kaydian, Flintshire can be delivered from 7am in morning to 9pm at night , please make yourself aware of this when accepting a delivery in , if you have any problems with the delivery time or cannot be available or have someone at home to cover these hours please inform the delivery company at time of phone call. Later nearer the day the Delivery company will call you to offer you a Eta time window for your delivery , if you cannot take delivery in the time window after already excepting the delivery day from original phone call you may be charged for another delivery day . • On the day of delivery they can give you a call 30 minutes before delivery. Please request this service when they call you to book in. • If they leave an answer phone message or text, your product will only be delivered when you call them back to confirm delivery. Please note some brands like Bedmaster deliver beds and mattresses direct to you themselves, however their delivery service is quite poor and only deliver to the front door of your building, regardless of what size bed or mattress you purchase you will have to accept delivery at front door of building only. So it may pay to look at other brands like Vogue, Siesta or Highgrove who offer a better delivery service. The next working day delivery will be available if purchased by 12 noon, or you can select a day in the future. Please note delivery drivers have only hand held scanners not phones , so they cannot call you before delivery , You must be at home or have someone at home to accept Delivery. There is a £40 charge for any delivery above Glasgow (see map). Goods are dispatched by ourselves or directly from our suppliers on this service. Delivery is between 9am and 6pm on the day selected. Please make sure someone is at home during this time to accept delivery. As this is a delivery service to the front door of the Building you live in Only , Not upstairs or inside , If you live in a flat or anything above ground floor level it will be your responsibility to get it to the desired room , Please note this service is currently running with a success rate of delivery on correct day of 80% success rate , so we strongly recommend you take up the 2 man room of choice 7-10 day delivery service as the choose a day service uses a outside courier which we have no control over and thus we cannot be held responsible for delays in deliveries, or if the address is difficult to find or needs a call before delivery. Please note we can send items under 5 Kg to Northern Ireland with a carrier called Parcel force for £10, this is usually next day service. Parcel force only take parcels less than 1 metre tall on this service, like quilts, pillows, toppers, single rolled mattresses. However we can send up to 140 cm size mattresses on a 2 day delivery service which is called over size, this will cost £20. The recycle of the old mattress is NOT available on this delivery option. If it appears in the cart please ignore, or re select the Express Delivery option. There is a delivery charge of £60 per item I.E So a Mattress , a Divan Bed ( mattress & Base) or Bed Frame ( with or without a mattress) Delivered to the Isle of Man or Isle of White. There is NO option for old bed/mattress collection or assembly for these areas. Please note there is Currently no Delivery Service to KW or IV postcodes But we do know of a courier who will deliver to these postcodes however he wants £140 per Bed or Mattress for Delivery , so we would Need £100 contribution from You . .Please note as there are so few deliveries going to these areas so please allow an extra 10 days for delivery. The recycle of the old mattress is NOT available on this delivery option. If it appears in the cart please ignore, or re select the Premier delivery option. 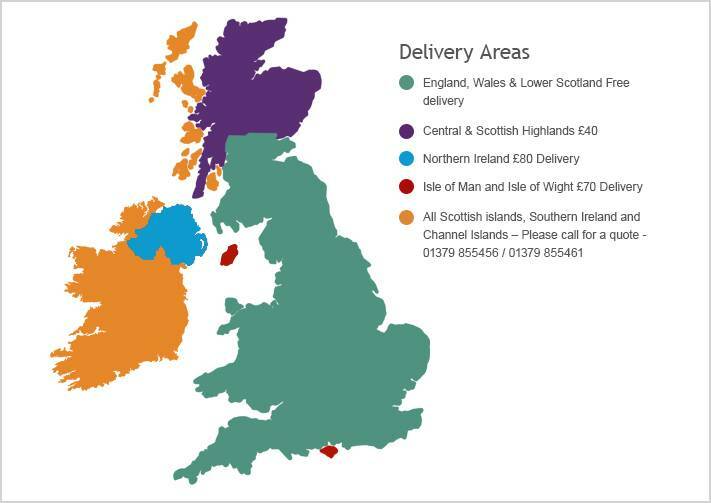 Deliveries or products taken outside England, Scotland and Wales Mainland or in to Europe are not covered by distance selling regulations so we offer no guarantee if you do not like the product when these arrive we cannot arrange collection of these products , we do not deliver outside of these areas for this reason , so you must accept the risk yourself when taking the goods outside of these areas. For choose a day Deliveries we use a DX Freight, they will only deliver to the first accessible ground floor door on all items and like all carriers they can be a bit hit and miss. currently they are running at a 80% success rate on deliveries on correct day. Because of this we do recommend having our Express Delivery which has a 100% success rate, as this service is by 2 men to room of choice with a call 2 days before delivery, a 2 or 3 hour time slot and even a call 30 minutes before arrival. Plus with the Express delivery service you have the option of having your old mattress taken away , whilst on the choose a day service there is no collection option.